This is a purposefully non-exhaustive selection: only fundamental texts (monographs on the artist, catalogs of one man shows on Ranzoni or on the artistic Scapigliatura movement, articles on newspapers and journals that were influential on the culture of the time) are listed here. From 1886 to his death in 1899 Ranzoni exhibited only eleven times and always in group shows, mostly in Milan, at the annual August September Exhibition of the Brera Academy, opened to all Italian artists (Esposizione annuale di Belle Arti, Palazzo della Regia Accademia di Brera). 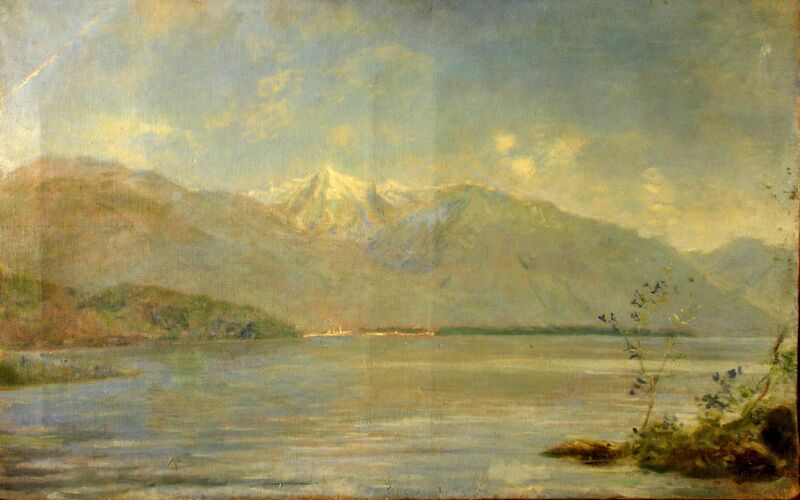 The dealer, critic and future painter Vittore Grubicy organized Ranzoni’s first one man show a few months after his death, in January 1890. Ranzoni has been rediscovered by Margherita Sarfatti, the ruler of Italian art during Fascism, who collected his works and wrote the first monograph. As a result of her patronage, he was always included in the regime’s official exhibitions, whether they took place abroad or in Italy. However, these sporadic inclusions did very little to bridge the gap- still lingering today- between the work’s significance and the lack of awareness of it among art lovers worldwide. Prior to World War II, three major artists attempted to promote a better critical understanding of his work: Arturo Tosi, Carlo Carrà e Ardingo Soffici. Ranzoni's early biographers were Renzo Boccardi. Giovanni Borelli e Raffaello Giolil : they were able to have access to primary sources, most of which are no longer available. The Scapigliatura Exhibition held in Milan at “La Permanente” in 1966 is the very first attempt to present Ranzoni in the context of the milieu which has been his. Ernesto Solari (edited), Catalogo della Mostra di Como, Salone del Broletto, Il Dossi e gli amici scapigliati, Manifestazione per il Bicentenario manzoniano, giugno in collaborazione con la famiglia Pisani Dossi). Only eight Museums, all of them in Northern Italy, own a few of Ranzoni’s works, most of his works being in private collections. The most important nucleus in public collections is divided between the Landscape Museum in Pallanza-Verbania and the civic collections in Milan, Galleria d’Arte Moderna and Castello Sforzesco. These two are the only public collections which possess both drawings and paintings. The municipal “Galleria d’Arte Moderna Paolo e Adele Giannoni” in Novara holds in permanent loan the two paintings of the Collegio Caccia, Ritratto di Giovane Donna and Fratello e sorella. Since the publication of the Catalogue raisoné, the museums of Varese (Castello di Masnago), Biella (Museo del Territorio Biellese) and Pavia (Castello Visconteo) have acquired through donation one or two paintings , oil or watercolor. The Picture Gallery of the Fondazione Cassa di Risparmio in Tortona has bought one painting. We would like to thank all those who have participated to this project.